Our official Showreel for 2019. showing a variety of different styles, clients, ideas and services. Devil Dance Disco – LightPainting Animation. Have you ever seen a devil dancing? We managed to give this little satan a move or two though I don’t think John Travolta would be worried! This video is the first in a series of experiments using stop motion Photography, Light Painting and Light Drawing. I think we did about 100 separate frames and used just over 80 for the final cut. Our official Showcase for 2018. showing a variety of different styles, clients, ideas and services. Merry Christmas and a Happy New Year. We hope you have a great time with friends and family over the festive season and an incredible 2018. We are looking forward to work with you next year. We will be back back in the Office from the 8th of January. Another year another Recovery Partners Christmas Video. I think we have outdone ourselves this time. With over 1,500 submissions from 32 countries throughout the world, Video Scribing has won a Centauri recognition in the 2017 Vega Digital Awards competition and excelled in its category, showing extraordinary prowess in digital creativity. The winning work, A Paediatric Journey, was created by Alex Kesselaar and Dani Vittz for Westmead Private Hospital. We are proud of our achievement and thank Bonnie Heynemann from Abes Studio for the Voiceover and Westmead private Hospital for giving us the chance to create this video. 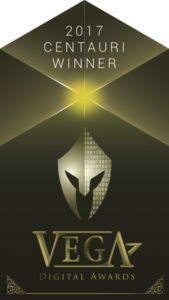 Vega Digital Awards is an international competition catered to all creative professionals who inspire through concept, writing or design through traditional or electronic media. “We hope to find, encourage and reward the newest and brightest stars emerging in the world of digital communications.” said Kenjo Ong, President for the International Awards Associates (IAA). Vega Digital Awards is administered and judged by IAA Global and a carefully selected panel of internationally-recognized creative professionals. Winners were selected from a broad scope of categories, from broadcast and print to social media and emerging platforms. Don’t forget to see our winning entry here.